Sometimes you have an image in your mind's eye that you just have to create. But due to limitations on technology, physics, and the environment it's is near impossible to capture the shot you want in a single exposure. 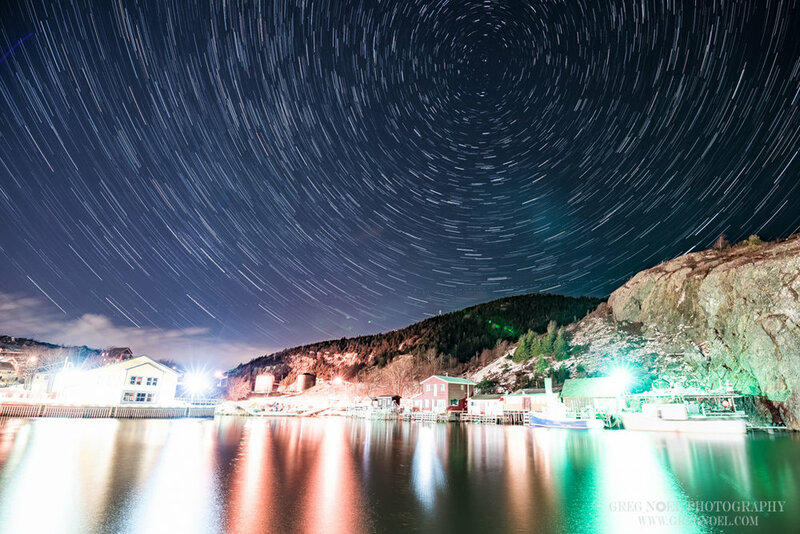 This happens often when you want to capture star trails because leaving the shutter open for hours to capture the movement of the stars across the sky will overexpose any foreground This was the case with shooting Star Trails in Quidi Vidi. Fortunately, there are some tricks to creating this type of image. Read on for a step-by-step overview of the process. Before I even left the house I had to make sure the shot I wanted was even possible. As in was the north star (Polaris) in the right place. Why does the north star matter? because That's the star in the center of that spiral. The way the earth turns causes all the other stars to move but the north star stays close to perfectly centered. Therefore I wanted to make sure that the north star would be in the frame during the shot. I opened google maps, and picked a spot on the other side of the harbor where I was facing north. This also gave me a general direction to point the camera once I got in position as it was tough to see the stars due to light pollution. A BTS of my setup. sorry for the poor quality cell shot. For this shot, I wanted to keep the camera as low as possible to the ground so that I would capture as much sky as possible. So I put my camera on my Platypod Pro Max with a Manfrotto Ballhead (I normally would use an Acracech Nomad, but left my QR plate for my Acratech Ballhead home by accident and had to resort to my backup ballhead that I keep in my car) and placed it on some wood near the edge of the dock. The sharp pins of the Platypod held everything in place nicely. The shot was captured with a Nikon D750, Tamron 15-30 f/2.8 lens. 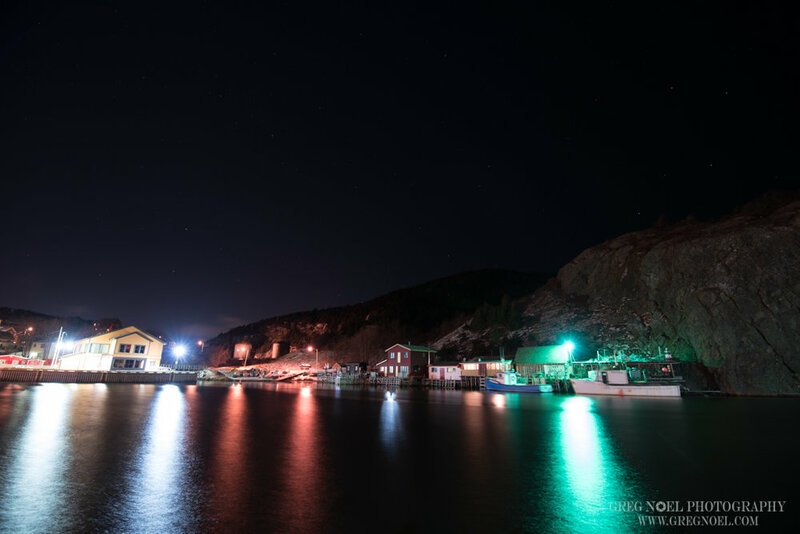 To help reduce the light pollution I used a NISI Natural Night Filter. And I used a generic digital timer cable release similar to this one for the intervals. As you can see there is a yellow cast to the entire scene and it's is very difficult to see the stars in the sky, you can see some but nowhere near as many as you can once the filter is added. The final image took about 30 minutes to take and is composed of about 45 individual 30-second shots for the sky and a 5 minute shot for the foreground. The sky shots were each shot at ISO 100, f/3.5 and 30s. By shooting at 30 seconds you don't blow the sky out too much and are able to get some motion of the stars in each individual shot. This is one of the sky images straight out of camera before any editing was done. One of the Sky images after processing in Lightroom. Major edits: Exposure increased 2 stops, highlights decreased, and shadows increased. I didnt worry about the streetlights in these as I was going to layer in a foreground after. The final example of the sky is a zoomed in portion of the stars, you can see how each star moves a little bit, when you put those movemetns side by side they create the trails in the efinal image. The foreground is composed of a single 5-minute exposure at ISO 100 and f/16. I wanted to keep the ISO as low as possible and shoot at f/16 to create the starbursts in the lights. Smaller apertures create those bursts. Here is the processed version of the 5 minute foreground shot. As you can see there is a LOT of lens flare. Most of it was easily removed in photoshop later. For comparison here is the foreground before processing. Still quite dark as I didnt want to risk blowig out the lights. Fortunately the Dynamic range of the D750 allows you to recover a lot of detail in the shadows by increasong the exposure in post. The next step was stacking the images to bring all the trails into one frame. To do this I use a program called StarStax. After exporting all the processed sky images I loaded them into Star Stax and this created an image of the brightest parts of all the photos. Here is the final output image from StarStax. Final output from StarStax. As you can see the foreground is overblown. So we need to add in the pre shot foreground from above. I wont go into all the steps and details on the Photoshop and processing process. but is basically involves taking the sky portion from the StarStax output and placing it over the sky portion of the 5-minute foreground. The some dodging/burning of different portions of the photo to adjust the brightness in different areas. And finally cleaning up the lens flares and dust spots. A screenshot of the working file, all layers used in the blending and cleaning up of the photo. If you have any questions please leave a comment or let me knwo if you liked this type of blog and I will try to do more in the future.